Palawan Beach, lies in the centre of the southern coast of Sentosa. There is a suspension bridge that leads to a small islet off the coast which is said to be the Southernmost Point of Continental Asia, or Asia's closest point to the Equator. However, inspection of any map, even those on Sentosa, show that this cannot be the case. There are several bars along the beach offering food and beverage to visitors as well as Beach Station of Sentosa Express. Palawan Beach was once served by Central Beach Monorail Station, but it no longer does after the station closed in 2005. 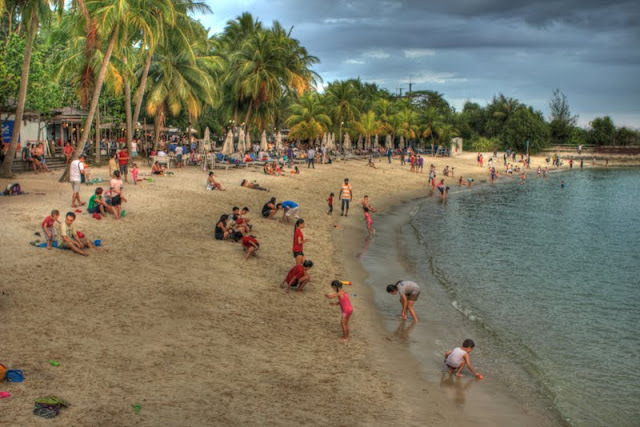 Siloso Beach, lies on the west portion of the southern coast and it is known as the place for beach volleyball and other outdoor activities such as canoeing, skim boarding, mountain biking or rollerblading. There are also dining and shopping outlets along the beach. The Rasa Sentosa Resort is located at the western end of Siloso Beach. 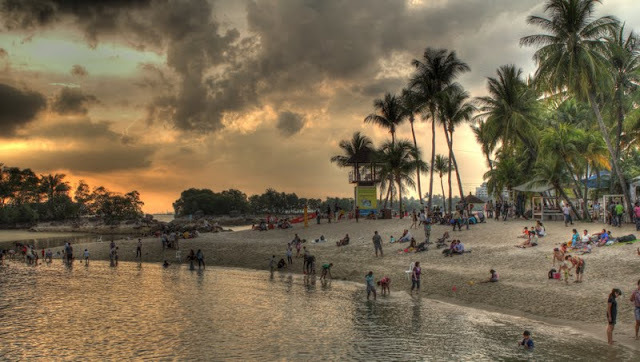 Tanjong Beach, is a relatively more secluded part of the southern coast. The crescent-shaped beach is sometimes used for special events or parties. The beach bar 'KM8' is located at the beach. KM8 had it`s last party and closed down on 28 March 2009.